After you've acquired those business wardrobe basics, the navy and a the grey suit, what should you get next? 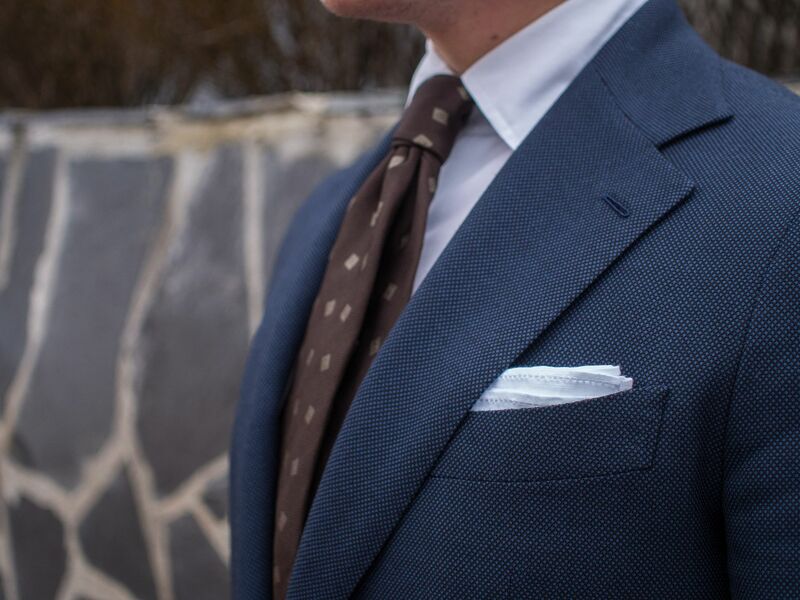 If you're like me and like different shades of blue, a slate blue suit is definitely something to consider. The grey ish blue is usually a lot less bright than other shades of blue, making it ideal for professional use. 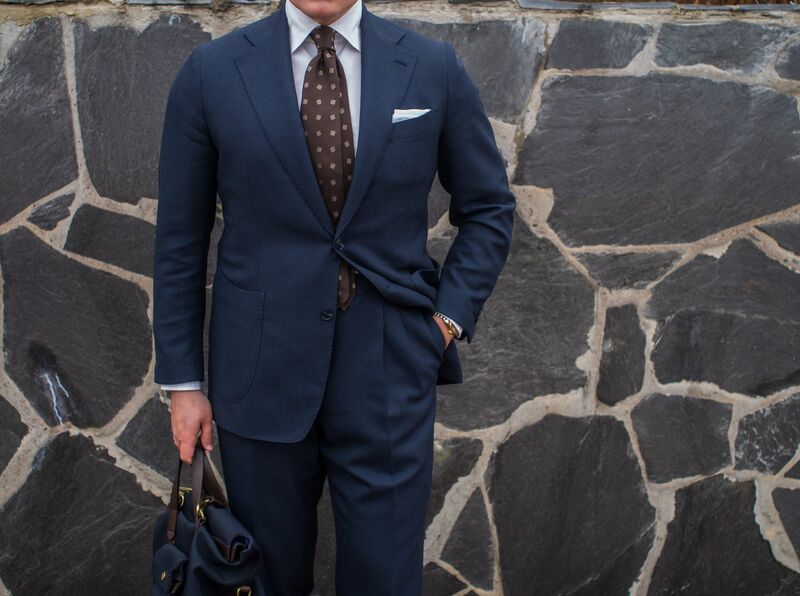 In some ways I think a good slate blue suit is one of the best ways to freshen up your suit rotation while still remaining professional-looking. So, that in mind I comissioned a new handmade made-to-measure suit from Sauma from a wonderful Dugdale Bros & Co 380g birdseye wool fabric. 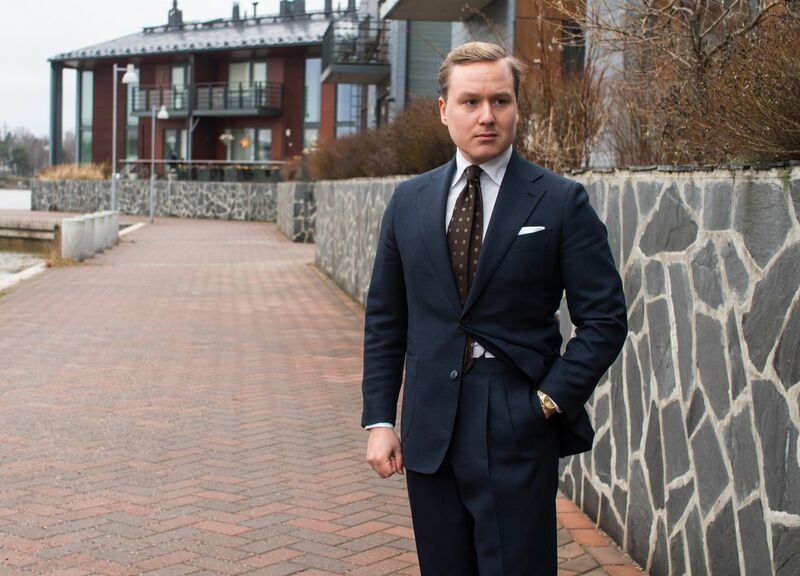 Having worn it for some weeks now I must say I absolutely love it - a great piece for both business and pleasure. 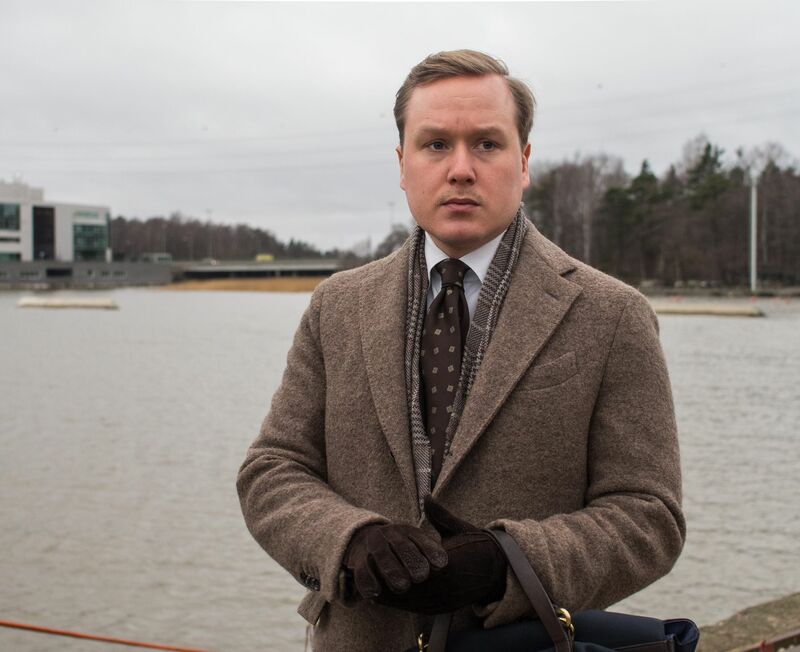 In these pictures I'm wearing a Lardini wool coat with handmade soft shoulders, Berg & Berg scarf, Madova Firenze carpincho gloves, Viola Milano 7-fold jacquard tie, House of Kydos handmade linen pocket square with hand-embroidered initials, Luxire mtm shirt with my custom collar, Albert Thurston narrow braces, Jeeves socks, Vass museum brown mto Oxfords, Mismo briefcase and a vintage Rolex Datejust. 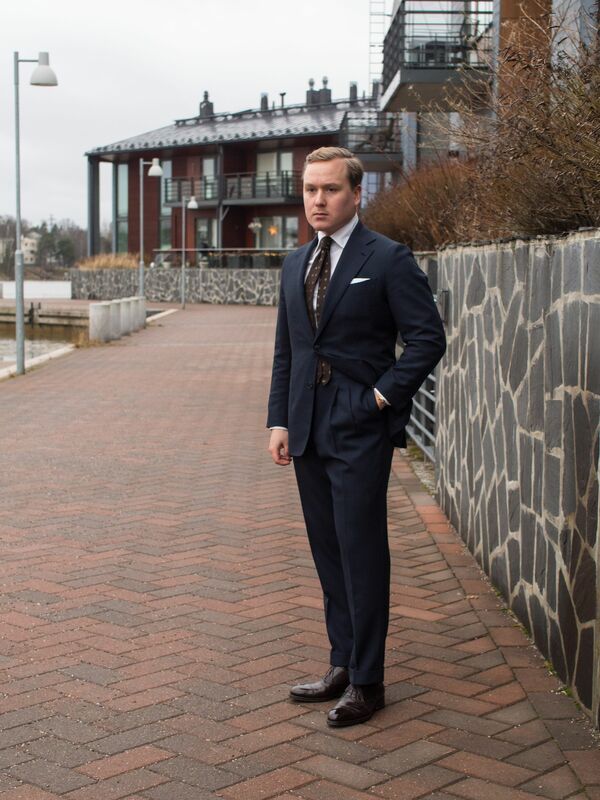 And the handmade mtm suit from Vaatturiliike Sauma of course. With this suit I wanted a little bit fuller leg and wider leg opening, so the trousers are cut looser than my other suits. The silhuette is still trimmed, but the overall look is a bit more relaxed and classic. The birdseye fabric looks surprisingly dark from afar, but the middle blue tones sort of open up the closer you are. 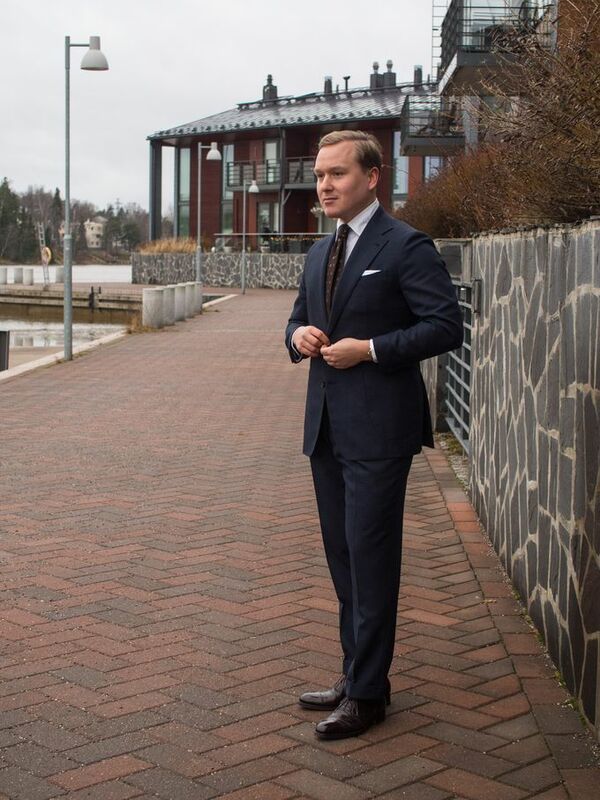 While I wouldn't call it a dark suit, it's still quite formal when combined with the appropriate accessories, shirt and shoes. Slate blue can clash a little bit whith some blue accessories, but other than that it works quite beautifully with most colors. 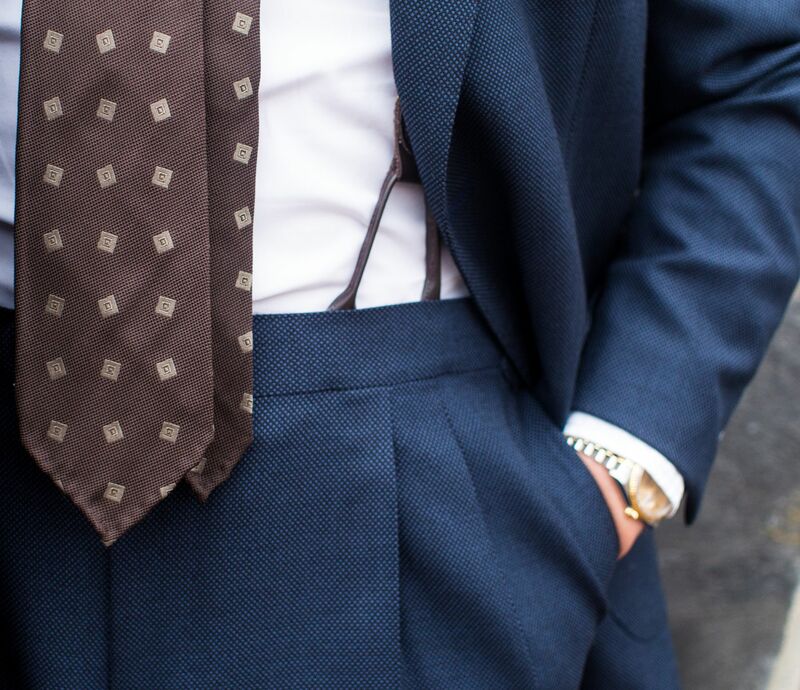 My favorite might be brown, and I must say I love how the suit looks with this tie especially. I was recently gifted this wonderful pocket square from Greek company House of Kydos. The square has a neat hole pattern near the edges giving it an elegant handmade look. It also makes a great pair for this 7-fold Viola Milano jacquard tie which must be the most three dimensional tie I own. A classic double pleat and no belt loops, like most of my other suits. 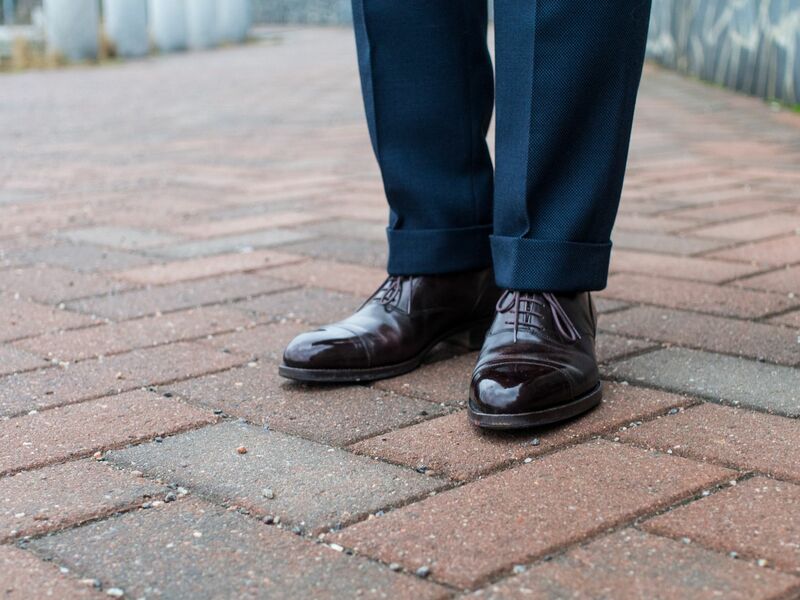 Color and style wise, my museum brown Vass Oxfords that are quite ideal for this suit. I also quite like how the polished shoes look with the heavier birdseye fabric.